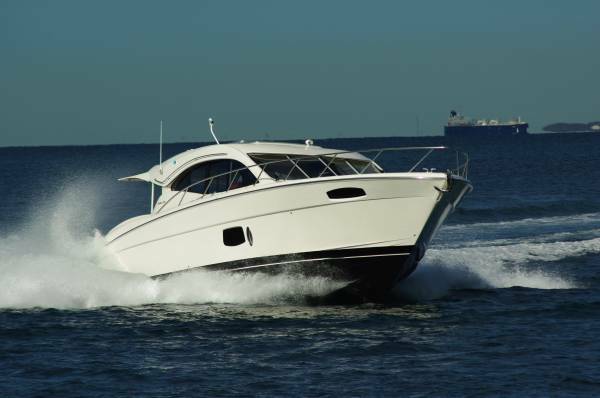 A 50-footer is a lot of boat but, just the same, Maritimo seem to have created disproportionate space in their C50 Sports Cabriolet - an achievement considering the saloon also has to house the driving position. 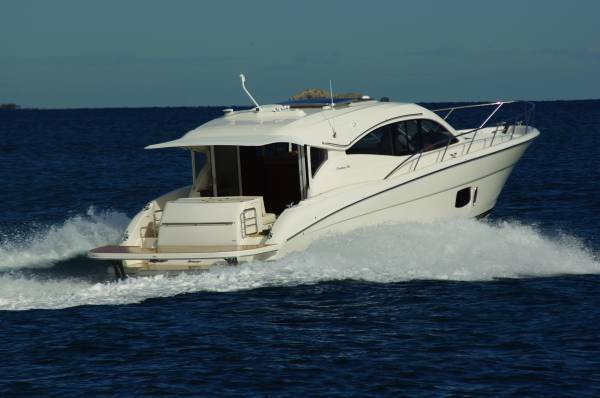 It is a typically well organized Maritimo driving position with satisfying quantities of switches and displays, but relative to the rest of the space it is unobtrusive and provided with just a single, if sumptuous, seat. The accommodation has the benefit of powerful climate-controlled air-conditioning, but the alternative fresh air is abundant. Triple-fold glass doors open up almost the entire rear to the cockpit, the powered skylight opens a big share of the roof, and sliding glass does the same for the side windows. In the eminently sensible style that is at last catching on, the galley is immediately inside the rear doors: convenient for the vast dinette, but at least as importantly for the cockpit, where most eating – and living generally – takes place. The galley fit-out features a four burner cook top, a microwave oven, dish washer, fridge-freezer, and masses of storage. The dinette seats eight without cramping around a dining table that folds ingeniously to coffee table size. As an alternative to dining, a 32-inch flat screen TV will emerge to order opposite the seating. Perhaps more important than the opportunities when seated, the open deck area of the saloon is big enough to handle substantial numbers of socializing people on their hind legs. The cockpit is on the same level as the saloon and in many ways duplicates its facilities. There is a fridge and ice maker (how did we live without them? 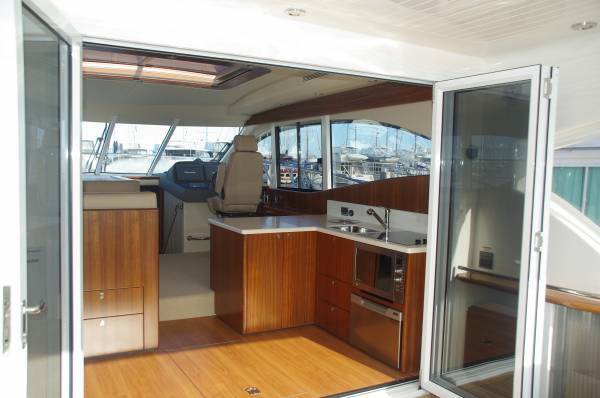 ), and in the transom console is an icebox that could double as a catch tank. There is also a sink in there and, reached from the rear platform, an electric barbecue. The whole is covered by a fabric awning extending aft from the hardtop that puts the aft settee well within the shade. There is no end to the wonders of the transom area. 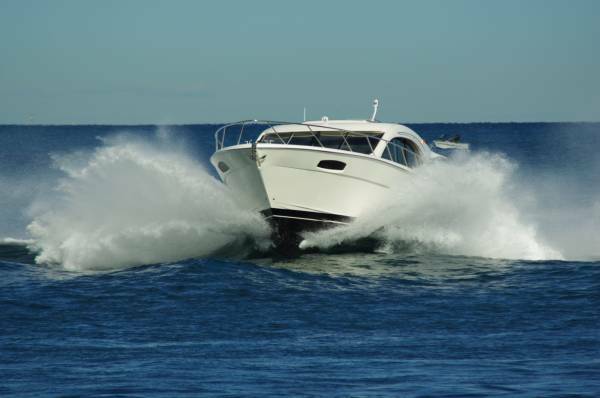 An extension to the platform raises and lowers hydraulically to launch and retrieve the tender and, with more button pressing, the console and a large part of the platform raises to expose the tender’s garage. The cockpit is a natural spill-over for the saloon, adding up to enough room to take twenty or thirty guests with spare elbow room, but the cockpit is roomy in its own right. Plenty of space for divers to kit up (naturally there is a transom shower for their later use), or to set up a picnic table and chairs; the platform will take more chairs, perhaps for fishermen to use on the mooring. Australian boats in general make it easy to reach all parts of the deck. The C50 has broad and shallow steps from the cockpit to the side decks, which in turn are wide enough for easy transit and are provided with excellent grab rails as well as side rails. Once on the foredeck those who like such things have the use of a double sun bed. Below decks are three sleeping cabins and two bathrooms. The owner’s cabin is amidships and has the luxury of a large window positioned for eyes at pillow level. Fortunately it also has blinds. The fit-out, like the whole of the boat, does not over-emphasise timber and is suitably restful – as is the queen size bed, which I tested. The wardrobe is big enough for a couple who believe in being prepared for any occasion, and the en suite bathroom is vast rather than simply big. The double cabin forward is similar in size, misses out on the low level window but compensates with two high level ones as well as a skylight, and has two large wardrobes. 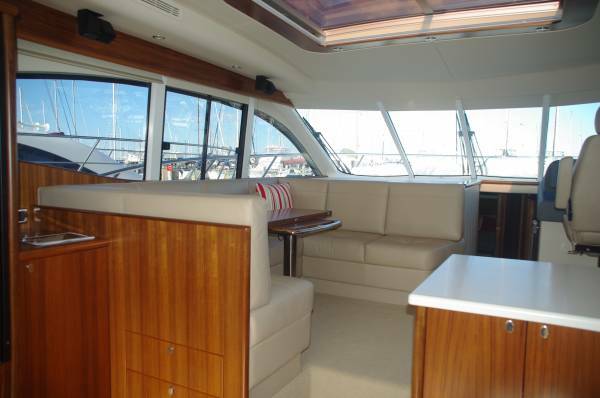 It also has more deck space than the typical cabin with island bed. This is a cabin for honoured guests. It shares a bathroom as large as the owner’s with the twin cabin. This one is on the small side, but effectively enlarges itself with the light from another large and low window, and has the second bed making an L with the first, making use of space below the stairway. Our C50 was powered by the optional twin C12 Caterpillars putting out 715hp each (twin 600hp Cummins are standard), and performance is as vigorous as those figures suggest. High speed cruise would be in the upper twenties, and the manoeuvring on differential power is crisp. Not that you have to depend solely on that: both bow and stern thrusters are fitted. The excellent vision from the driving seat helps manoeuvring, and a windscreen wiper for every forward segment of glass ensures vision stays good. 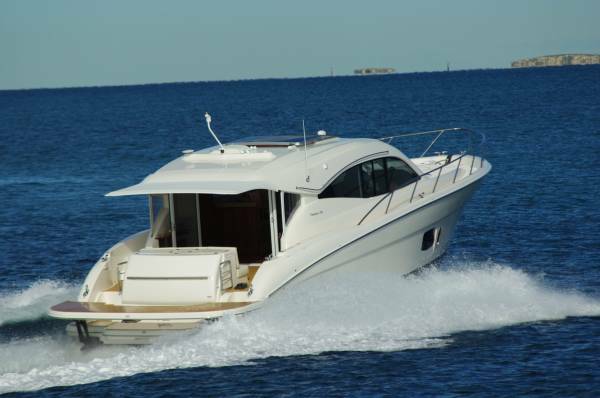 This is a boat that deserves some serious cruising, but on the other hand I would still happily take up an invitation to a Rottnest weekend on it.